Xorvasc is a Master Pet Tamer found just southwest of Andu'talah in Val'sharah. He's only available to fight when his world quest, Dealing with Satyrs, is available. To level a pet on this fight, I used the Unborn Val'kyr (Shadow Shock/Curse of Doom/Unholy Ascension) and Yu'la, Broodling of Yu'lon (Breath/Emerald Presence/Life Exchange). The strategy could work with either of these pets subbed out but not both. If subbing out the Val'kyr, you could use Mr. Wiggles (Diseased Bite/Buried Treasure/Uncanny Luck) and in place of Yu'la you could bring a Magical Crawdad (Surge/Shell Shield/Wish) or your best crab with Shell Shield/Aquatic damage. The leveling pet needs a minimum of 600 health. Start with your leveling pet, use any move and don't switch him out. Xorvasc will Nether Gate, bringing out your second slot pet (Val'kyr). Spam Shadow Shock until Trixy dies. Globs comes out. Cast Curse of Doom on Globs, then spam Shadow Shock until your Val'kyr dies. Use Unholy Ascension on your Undead racial immunity turn. Yu'la comes out. Cast Emerald Presence first, then spam Breath until Globs dies. Use Life Exchange on the first round against Nightmare Sprout, then spam Breath while maintaining your Emerald Presence buff. If using Mr. Wiggles instead of the Val'kyr, use Diseased Bite while healing on cooldown with Buried Treasure. Do that as long as possible and cast Uncanny Luck when you think Wiggles is about to die. This doesn't get you quite as much momentum as using the Val'kyr but Yu'la should be strong enough to finish the fight. Xorvasc is one of the new pet tamers for Legion world quests. His pet Trixy can be a bit annoying because it swaps your pets around, but nothing that can't be avoided or counted into some nice strategies. Using a snail (any level 25 rare) and a Mechanical Pandaren Dragonling you can even bring a carry pet along and get some nice XP! Or you might want to go for Family Familiar? No problem! Beware! If you happen to be on the quest A velhos amigos you will be phased in that area and cannot see the the Master Pet Tamer. Just finish the quest, and you will see Xorvasc and can start the Pet Battle. Dando um jeito nos sátiros is randomly available in Val'Sharah (63.70, 60.77) and only visible if you've unlocked World Quests. Rewards will vary. Xorvasc is part of Família dos Familiares & those strats are being accumulated at the bottom of the post. - I used Pwuebear's Aquatic strategy - link here - which uses Belaruga Ninja, Andarilho Eterno (alts), Lagostim Mágico (possible crab alts). - hobbesmarcus has a 3x rabbit/hare/cottontail/bunny strategy (requires certain speeds: 1st > 333, 2nd/3rd > 289) - link here. - I recommend Rikade's Dragonkin strategy - link here - which uses Chrominius and two Dragons with Golpe com a Cauda. - I recommend Elenda's Elemental strategy - link here - which uses Espírito da Água Pandaren, Gumedonte Eletrificado, Ondino d'Água. *Arraia Etérea shares same moves as Fledgling, FWIW I was only able to test S/S breed. - I used Amerelock's Humanoid strategy - link here - which uses Ídolo Anubisath, Broto de Sporeggar, Nanico do Kun-Lai. - I used SkylineXoXo's Magic strategy - link here - which uses Arauto do Caos Inferior, Morelita Desprendida (alts), Caçula, a Lula. Slot 1: I used a Zelador do Viveiro (1,1,2), but the Escudo Refletor from Microdefensor Draeneico (1,1,2) would also be good. Try to Surra, probably die. If necessary, clean up with slot 1 mech. Save Canhão Iônico until it will kill - whittle down with other attacks until this is possible. - Ex. for Zelador do Viveiro, whittle with Choque e Admiração & Fulminar. Tried both breeds of Scourged Whelpling and H/H uncommon Crab. Unborn Valkyr is back on track, shadow shock 1or 2 times (whatever you prefer) and then haunt. Use life exchange and then breath 2 times pet is dead. @ the last pet use Yula (breath) till she dies. Emerald Presence is a nice damage block. Yula died in my attempt, when the Elemental did have 50 hp left. I switched to my leveling pet (Raven lvl 13 for the xp. You can bring back Unborn Valkyr if you want to do it in 2 times. Be aware I did this boss in 1 atry, so my guide will maybe not work all the time, if you don't push the right button or if you're unlucky. Pet 1: Ídolo Anubisath with Esmagar, Tempestade de Areia, Deflexão. Pet 2: Broto de Sporeggar with Jabe, Semente Sorvedora, Agachar. Pet 3: Nanico do Kun-Lai with Derrubar, Choque Gélido, Congelamento Profundo. Round 7: Deflexão this will block Trixy's Portal do Éter, but also Glóbulos Expurgar Veneno ability. Round 8: Refresh Tempestade de Areia. Round 9 - Until Ídolo Anubisath dies continue to use Esmagar. By the time Ídolo Anubisath dies you will have killed Trixy and almost killed Glóbulos. Just finish up with your Broto de Sporeggar using Agachar and Semente Sorvedora off cooldown and Jabe when you have nothing else to use. If needed for Broto do Pesadelo, use your Nanico do Kun-Lai with Choque Gélido and then Congelamento Profundo and Derrubar to finish him off. I'm loving these pet battle world quests. Dealing with Satyrs - World Quest, Pet Battle Guide for The Lil' Necromancer, he is only available during his World Daily Quest taking on Xorvasc. He is a Grand Master Pet Tamer, he is a tough fight... sometimes! Open with the Pup Howl, he will get switched out for the Val'kry use Curse of Doom then Shadow Slash till its dead. Use Ascension when during her undead round. Then bring in the Pup and Howl, Plague and bite to victory! If plague is still on target when he dies just tail sweep to victory with the Whelping if not reapply plague. Pretty simple. Below is my YouTube video I made for the fight, drop a comment if you think I could of done something different. SoG; dive, paralytic shock, jolt. Should get it done. Switch to moonshell crab; shell, mist, slash until crab dead. Finally ghostshell crab; whirlpool(just one), shield, grasp to victory. I used Stitched Pup, Emerald Whelpling and Fen Crab as my line up against this guy. It took 2 tries to get him down, but it worked really well. Start with adder; poison fang, poison fang. Diseased bite until fel pup is dead. Flame breath until globs is dead. Make sure they're in this order so they will swap in correctly. Round one opens with Trixy going first. She'll do some damage; apply Plagued Blood. Round two doesn't matter as Trixy will use Nether Gate to bring in your Unborn Val'kyr. Round three, apply Haunt. Bring Son of Sethe back out. Round four, apply Drain Blood which should heal it close to max. Then continue using Plagued Blood until Trixy dies. When Globs comes out, apply Plagued Blood. You might be able to do this twice. Don't bother with healing as SoS is going to die very soon anyway. Globs' second attack - acidic blood - is strong against undead, which is the only sticky (ha ha) part of this fight. When Son of Sethe dies, bring out Scourged Whelpling. Tail sweep a few times and Globs will die. Finally, Nightmare Sprout comes out. At this point you just DPS him down. Tail sweep until Scourged Whelpling dies, then bring Unborn Val'kyr back for the short finale. He'll probably heal once but he'll go down fast. Make sure Untamed Hatchling is your 2nd pet because Trixy forces your pets to swap after 1st round. Use - Spiked Skin 1st, then spam Tail Sweep with healing flame on CD. Was able to use Spiked Skin & Tail Sweep on Globs before dying. Emerald Proto Whelp I used Emerald Presence & Emerald Bite with Emerald dream as needed until Whelp died on final pet Nightmare Sprout. Nightmare Sprout was easy.. Just use Howl & Surge of Power and done. For the elemental one I used Pandaren Earth Spirit (2/2/2), Pandaren Water Spirit (any/2/1) and Lil' Ragnaros (1/2/1). There was honestly no real strategy to this, Pandaren Water Spirit carried the fight. I started with Earth Spirit and put Rock Barrage up, the imp Trixy swaps him out on the second round for Pandaren Water Spirit and I finish him off with a regular Whirlpool+Dive combo. When the Globs comes out(tough against water) just swap Water Spirit out and try your best to kill him with Ragnaros(any high dmg elemental prolly works here)+Earth Spirit. The Flamethrower+Conflagrate combo from Raggy dealt enough damage to leave him low. Earth Spirit comes in and finishes him with a Stone Rush. Do as much dmg as you can on the flower with Earth Spirit(I used barrage for the dot) and when you're forced to put in water spirit just do the Whirlpool+Dive combo again, he should die easily. All in all the only invaluable member of this team felt like the Pandaren Water Spirit, the others can probably be exchanged for something better. My elemental team was Pandaren Water Spirit (1,1,2), Electrified Razortooth (1,2,1), and Water Waveling (1,2,1). The Water Spirit can lay down Geyser before before getting swapped out, then have Razortooth cast Rip and Blood in the Water once, before Geyser finishes off Trixy. Razortooth will have time to Rip and do one part of Devour before dying, then bring back in your Pandaren Water Spirit. Geyser, Heal and Water Jet until, again, Geyser kills Globs. You should get one Water Jet before your Pandaren Water Spirit dies, then Water Waveling can lay down a Geyser, and follow up with a couple of Water Jets until Nightmare Sprout dies. Start with the Amethyst and the Clouded Hedgehog should get knocked into place after the second round attack. Hope this works for you guys! My Bucktail was only level 21. For Murlocs, harpias, guaxinantes... minha nossa!, I had an easy time with Ídolo Anubisath 111, Irmã da Tentação B/B 111, and Arauto das Chamas 222. Won on first attempt, and I wasn't particularly lucky. Libram vs. Trixy - Curse, Amplify, Trixy will force out your 2nd pet, switch back to Libram & Amplify again, then Shadow Shock should kill Trixy. Globs comes out & you can try to get a turn in but Libram will probably die. Nightmare Sprout comes out, continue the Wisp rotation until Wisp dies. Bring out Legs and two Pumps should kill Sprout. If not, Surge of Power should definitely finish the job. I was determined to figure out a team for this guy before coming here. It took a few tries, but I got one that worked. I can't promise it is optimal or will work every time, but hopefully this helps as the pets I used are fairly easy to obtain or use similar equivalents of. Important note going into the fight: His pets are all VERY fast, and none of the pets I tried were faster than any of them. Maybe if I'd used flying, but... nah. Also his pets' races are as follows: Humanoid, Magic, Elemental. I threw down Death and Decay. When Scourged Whelpling got swapped out, I swapped back to it (in my attempts, I only noticed being swapped out once per fight) and then spammed Plagued Blood. Both pets died at the same time, and I use Tail Sweep against his magic pet. With the Snail, I used it against the Magic pet as well as the Elemental (if it survives). (I am not sure why I chose the snail, but it's great against Elemental attacks (and vs Elemental races. I was on some pain medication at the time...) Thing is, it still worked out just fine! Anyway: Dive is very useful against the Elemental but even the Magic pet (though water attacks are weak vs Magic) due to the fact you are immune for a round, and Dive deals a fair amount of damage. So I used Dive as an opener (same with the Elemental pet if it survives to that point). Then use Acidic Goo, spamming Absorb as Filler. This will heal your snail a bit for survival. Use Magical Crawdad against the Elemental pet. First Whirlpool. Keep Renewing Mists up after that. Use Surge as filler. I hope this helps! You can swap in any pets with similar abilities. As an aside, I was going to use a Mechanical Pandaren Dragonling against the Magic pet, but mine are only level 1 - time to get to leveling! But if you have one of those, it will be good. I'll work to formulating a more ideal team for myself, but I hope this helps others who are struggling to find a capable team. The trick is getting his first pet down in one pet imo, which is where my primary struggle was before I landed on this group. Fetish Shaman can be replaced for example with an Unborn Val'kyr or a Restless Shadeling (Shadeling is also a good opener, thanks for Phase Shift). all snails/whelks, 2,2,1: diving and absorb; used shell also on third round against elemental sprout. Snail vs Trixy - Shell Shield\Dive on cooldown then absorb, when he gets switched to U.V. throw doom then back to snail Shell Shield\Dive on cooldown then absorb till Globs. Ironclaw Scuttler - Dive (mine crit and 1shot him) but if still in fight Spiny Carapace and Claw Dive when able. Ez win! just make sure on 1st fight when you get switched to your second pet, switch back to your snail each time. Sorver Vida on CD - this pet will be swapped for Porco-espinho Nevoento almost immediately. I swapped back to Aranita de Chihong before Porco-espinho Nevoento died just so I could get the xp on that pet. For Roboteer, my team was Mechanical Pandaren Dragonling (1,1,2), Rabid Nut Varmint 5000 (2,2,1), and Clockwork Gnome (2,1,1). Start with Mechanical Pandaren Hatchling and use Bombing Run. Trixy will then swap in your Nut Varmint. Rabid Strike until Trixy dies. I think I got one Rabid Strike on Globs then my Nut Varmint died. Bring back in Mechanical Pandaren Hatchling. Against Nightmare Sprout, use Decoy. Breath until Bombing Run/Decoy are off cooldown. Repeat until your MPD dies. I only needed one Railgun from Clockwork Gnome to finish off Nightmare Sprout, but you should have his full health to take down the last pet if RNG hasn't been on your side. I use 3 hatchlings for the Revoada achieve (I figure most people reading/doing this quest will have them). I've revised this one using a different hatchling and it's working every time with only a little variation at the end depending upon when your Filhote de Garraguda dies (this is discussed below but, basically, it's not that big of a deal lol). Of course, I did have it happen once in the many times I ran it where Glóbulos got an insane crit on his very first attack that one-shot my Filhote de Sanguinolhos at 1330/1400 health - so if Glóbulos gets off a nasty crit on an attack and blows up your Filhote de Sanguinolhos too early just reset and go again to save yourself some headache. Use Ataque Predatório - Broto do Pesadelo should die even if Consumir Cadáver was used the previous round (Broto do Pesadelo's health should be under the 920 or so damage that the Enxame de Falcossauros!-buffed Ataque Predatório will deal even on a non-crit). Of course, if it doesn't it will maybe have a couple health left lol. Again, if Glóbulos wrecks your life just reset as it would take a heck of a stroke of bad luck to get it twice in a row. Otherwise, the only real variation I've experienced was the death of the Filhote de Garraguda during the final fight, but I've set it out above following the earliest death so the most likely difference SHOULD be a longer-lasting Filhote de Garraguda and a consequently shorter-lasting Broto do Pesadelo. Dark Whelpling - Tail Sweep until second pet dies. When Dark Whelpling dies, switch back to PWS, Geyser (third pet heals), Dive, then Water Jet. Use your hatchling if you need to for cleanup but it probably won't get to that. So, I based mine off Rikade's team as I don't have every pet from their team. 13. Tentacle Slap - Nightmare Sprout dies a horrible watery death, Win - if RNG doesn't go your way here and for some reason Nightmare Sprout is still alive, a round 14 Tentacle Slap *should* finish him off. I haven't seen it still alive in round 14 to test it. I didn't document everything I did but I made sure to use the Val'kyr's Curse of Doom on the first pet and the last. In the end, didn't need the Snowfeather much until pet 3. I could have used the curse on the second pet but decided to save it for the last one. None of the above methods worked for me. Here is a screenshot of what I used which was successful (close call) for me. 1. Golden Civet (Dive first round to avoid damage and swap. Manually swap to Restless shadeling. Swapped back to this pet for Nightmare Sprout and used Dive + Bite until around 30% health remaining, then used Survival + Dive/Bite to finish the battle off with 1hp left). 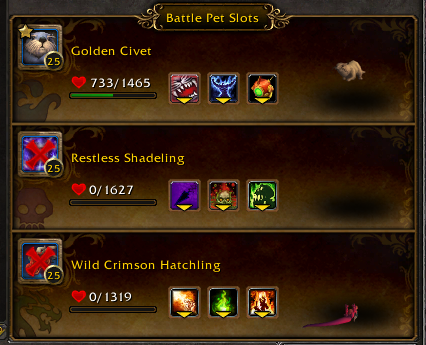 In general, if I did not have pets needed to do any of the strats or close variations of them, I was successful using my highest health pets of the appropriate family. Any spider with brittle webbing and leech life will work. Use the highest speed ones you have.